The fig is an ancient tree native to western Asia. It loves the hot, dry summers and cool, wet winters of the Mediterranean climate. It's not a frost hardy tree, but the cool climate gardener can still enjoy the lovely fig. Plant it in a large pot and keep it in a sunny, airy spot in your house. The large, lush leaves create a beautiful focal point in any room. Mix 2 parts pine park, 1 part perlite and 1 part aged and composted cow manure and 1 cup of ground limestone in a bucket or bag. Select a 5 gallon planting pot that has several drainage holes in the bottom. Lay pieces of pottery shards loosely over the holes. Fill your planting pot half full with the potting mix you created. Turn your fig sapling on its side and, grasping the base of the stem, wiggle it free from the nursery pot. 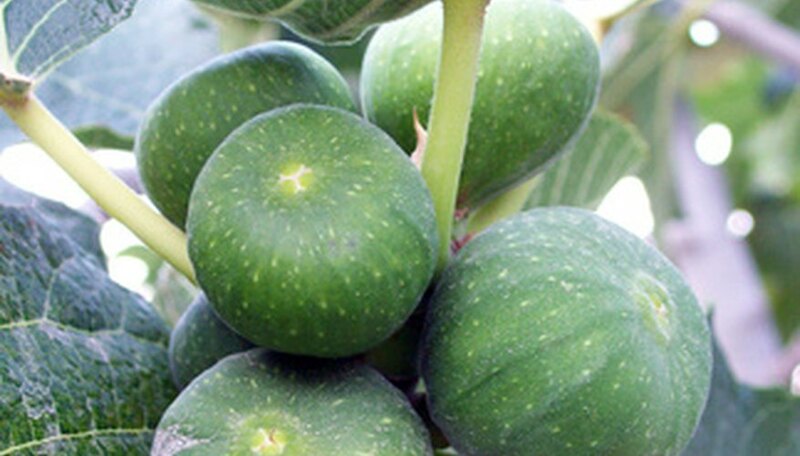 Hold your fig in the planting pot so that the base of the stem is 2 inches lower than the rim of the pot. Add or remove soil until the tree can stand on its own. Fill in the soil around the root ball a few handfuls at a time, patting it down as you go. Water the pot until water begins to seep out from drainage holes. Spread a 1 inch thick layer of bark mulch on top of the soil around your fig. Keep the mulch 1/2 inch from the base of the stem. Place the fig next to a sunny window or on a covered porch where the temperatures do not drop below freezing. Water the pot once a week or whenever the soil under the mulch begins to feel dry to the touch. Wipe down the leaves with a damp cloth or mist them with a spray bottle to keep them free of dust. Fertilize using 1/2 pound of nitrogen split up into four applications. Fertilize once in late winter, early spring, late spring and in early summer. Move your fig into a 10 or 15 gallon pot when you notice roots beginning to grow over the edge of the pot. Put a tray under the pot to protect surfaces when you water, and empty the tray regularly. If water builds up around the root system, the roots will rot. In warm weather, you can move your fig outside for some fresh air and light. If you can move the pot, placing it in the shower for a weekly cool water bath will keep the leaves dust free and healthy.